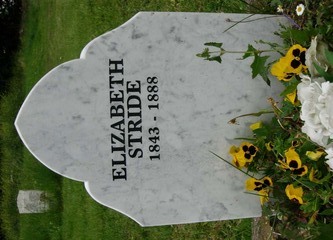 “Long Liz” or Elizabeth Stride was born Elisabeth Gustafsdotter in Sweden. 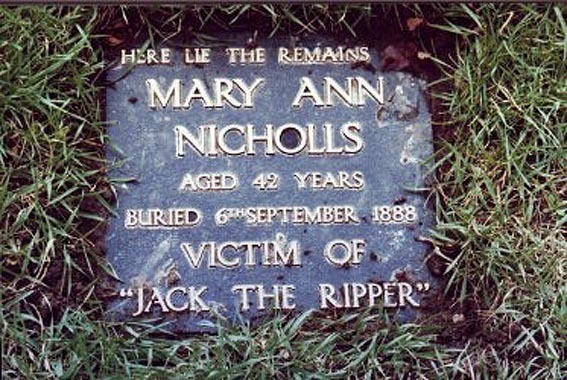 She died 30th September 188, and was the third victim in the Ripper canon five. That afternoon she was cleaning rooms in the lodging house, 32 Flower and Dean Street, where she had been on and off for the last six years. The deputy cleaner, Elizabeth Tanner, gave her six pence for the chores. 6.30pm she was drinking in the nearby Queen’s Head pub, she came back to the lodge house at 7pm and borrowed a clothes brush as she was ready to out. She chatted with a lodger and then headed out about half an hour later. It rained that night, (trust me that’s no surprise in England) and she was then seen 11pm when she sheltered in the doorway of the Bricklayer’s Arms. She was with a man about 5’5 and he wore a black mourning suit with a billycock hat. The man was hiding and kissing her, as he was a respectable looking man the witnesses, two men, saw it as a little odd and shouted out a bit of banter their way. 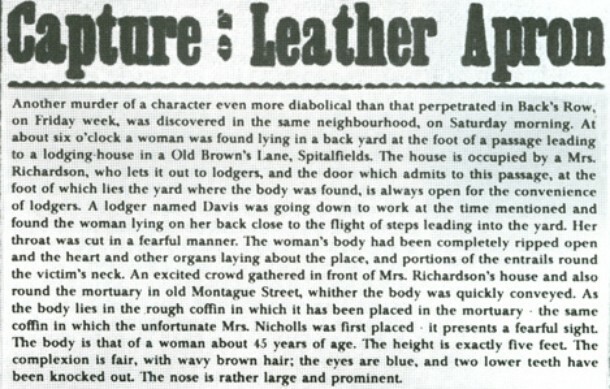 They told the woman to watch out as Leather Apron would be after them, this was the known name for the Ripper at that time. Apparently a little embarrassed they hurried off after that. 11.45 a man and woman were spotted kissing by a labourer, he made a remark and they again headed off. The height matched the previous chap but he said this man looked like a clerk of some kind with a round cap on, a small sailor-like peak. By 12.30pm that night PC William Smith was to come across them both as well at Dutfield’s Yard. He said the man he saw did not match either of those from the prior talks either. This time the man was 5’7, wore a dark overcoat and deerstalker hat. 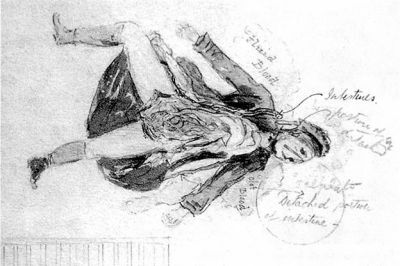 He also identified her but added she had been wearing a flower pinned to her jacket. There was a period that cannot be traced for her actions but 30 minutes before the body was found a Hungarian Jew, Israel Schwarz, turned into the yard around 12.45am and stopped to talk to a woman standing in the Dutfield’s Yard gateway, he was very certain that it was Stride herself. He spoke no English and he used an interpreter, he may well have been witness to the start of the events but the police didn’t scrutinise him too well. Another part I feel worth noting is that there were differences in the details given between interviews to police and journalists but more so I think it is worth noting he was around 5’5 and had dark hair, broad shoulders and was possibly slightly drunk. He felt that he was witness to a domestic attack, a man pulled her into the street, spun her around and then threw her onto the pathway where she tried to scream three times, but says it was not loudly. He says he crossed the road to avoid ending up involved. He said he saw a second man nearby who called out Lipski to the man and then the second man followed Schwartz. By this time Schwartz panicked and ran. He says the second man was around 5’11 and looked quite fresh and clean, this has led to yet more speculation an accomplice was involved. Yet another conflict arises with the details of the man not being identified officially, but according to Chief Inspector Swanson he was not a suspect. 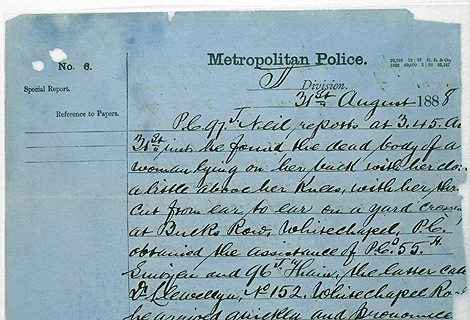 It is now know that another woman was killed around the same time, 12.45 – 1am Elizabeth Stride and the fourth victim, ‘Kate’ Eddowes (more on her another post in). 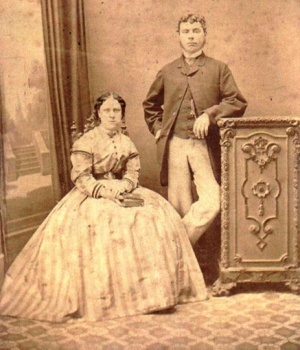 1am Louise Diemshutz, had come back from hawking cheap jewellery and turned the pony and cart into the yard. The pony would not more in and so he headed towards the bundle causing the issue. Striking a match for a better view he spotted a woman lying on the ground and thinking it was his wide he headed into the club, when he found his wife safe he said to the club members he could not tell if she was drunk or dead. Off they went to investigate. Several men were witness to the horror, a woman lay with her throat cut. They arranged to get a policeman and Diemshutz with a companion shouted out Murder and Police to be heard along Fairclough Street. They met Edward Spooner who came with them and looked at her, tilting her head they saw how bad it was. The blood ran from the body to the door of the club and in the woman’s hand was a piece of paper with breath freshner in it. PC Henry Lamb was the officer brought over and the crowd was now around 20/30 strong. Lamb got them to back off and said to get the Dr. In contrast to the other victims so farhe had also said that she seemed to have been laid down quietly and her clothes did not look disturbed. Dr Blackwell said he estimated she had been dead between 20 and thirty minutes. He could not tell if the scarf she had on was there before or after, had she been standing up the scarf could have already been on. He had cut through her windpipe and she had bled out, no residents had seem to have heard anything nearby and having interrogated the locals present found no further leads. They tried a hiding place in a loft but found it empty, then they arranged the body to be moved and by 5am the blood was being washed from the yard. From my perspective whilst she seems to have died on the same night, I actually find her the more dubious of the canon five as a victim. Here are my reasons (please note only MY opinion) is that the skirts were not moved and throat slitting is still, and was, a pretty simple method of removing a life. 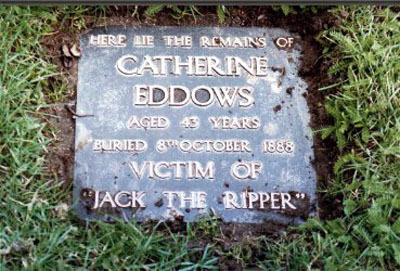 She also seems to be very closely timed to another Ripper Victim and with so much movement in a short space it is worth considering that this would not have been an easy movement to make. 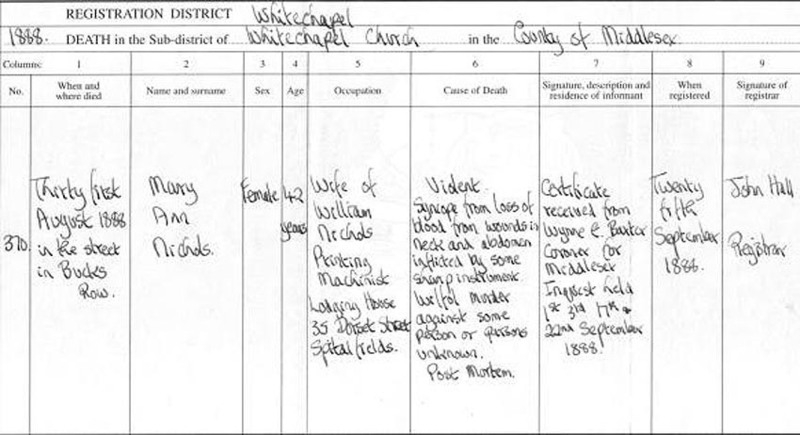 The lack of lower mutilation and the fact the witness seemingly saw a lead up argument that might well be the murder with her, I have to wonder if she wasn’t merely a victim of a murder who’s escalation in fame is due to the others of the time. Again… this is my opinion, she is counted as Canon and I am just playing armchair detective with those ideas! 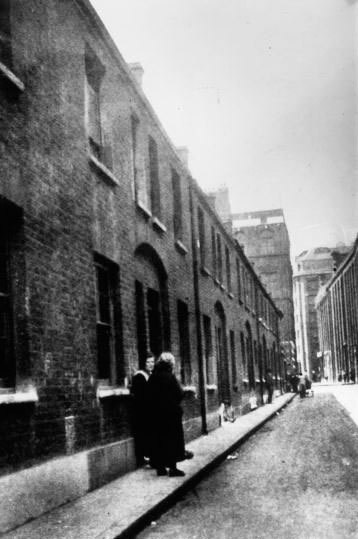 Annie was a wander of Spitalfields, a 45 year old, short and plimp lady who had been living at Crossingham’s lodging, 35 Dorest Street where it cost 8 pence a night for a double bed. Annie was a person that lept some fairly cordial relationships, was not so offensive but had a weakness for drink. She did crochet work, made and sold artificial flowers and made up further money where she could with her work as a prostitute. Harry the Hawker and Ted Stanley where both her regular clients. Stanley would often spend Saturdays to Mondays at Crossingham’s. He said Annie was told to turn other men away for him, he in turn denied this fact saying that he had only visited her once or twice. It was the only time trouble for Annie was with the “pensioner” Stanley. It also transpires he was a brick layer and not a pensioner. There was another incident reported, though the details are sketchy so perhaps little can be placed on it but a woman named Eliza Cooper said she had loaned Annie a bar of soap, Annie gave it to Ted and when she kept asking for it back was thrown a ha’penny to go and buy some more. Apparently this carried on, a few days later Annie slapped Eliza and a fight broke out, Annie apparently the worse off for this as the bruises were evident in the post mortem. Annie’s last days were spent in pain, her health was on the decline and when asked by a friend Annie reponded with opening her dress to show bruising on her chest. A few days later Amelia (the same friend) saw her and commended on being very pale and Annie agreed saying she felt no better and planned to go to the casual ward for a few days, she had also only had a cup of tea that day, Amelia gave her two pence and warned her not to spend it on rum. Three days later she was even worse and was still standing there ten minutes later when Amelia Palmer walked past. She told her she had to earn the money for her lodgings. 7th September 1888 Annie turned up at the Lodging House and asked for a stet, she was allowed to the kitchen and sat there till the early hours. She was too ill to work and had been in the infirmary when she was rejected from the lodging house having had some potatoes and seemingly worse for wear due to drink. He told her if she could find money for beer she could find the money for rent. She headed off tipsy and off towards Spitalfield’s Church saying she would be back for the bed with the money. 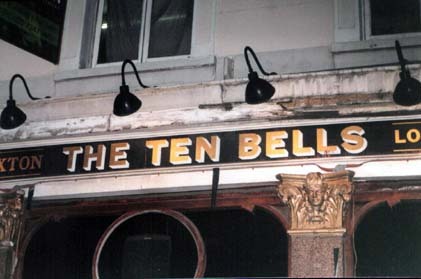 Later that day a woman fitting her description came in to the Ten Bell’s Pub, a man in a “little skull cap” came to call her out. Regardless of the movements and trying to fill in missing hours it is assured that by 5.30am she was on her way around Hanbury Street not far from the Ten Bells. There were houses there with backyards, hallways and landings used for illicit purposes of the prostitute’s trade. Number 29 was typical of this and John Richardson enters the situation at this time. Some months prior to this particular even the padlock from the cellar door into the backyard had been broken, this meant a more regular check had to be done on the premises to make sure all was well. That morning one of his boots pinched on a toe and so he sat down to trim the leather off with a knife. From where he was sitting he saw the padlock was in place and saw nothing suspicious. Between 5.15am to 5.32am Albert Cadoche, local carpenter, said he heard a woman’s voice saying no but could no be sure which property though it was between 27/29. He said it sounded like something suddenly touched the fence but he carried on along his way instead of looking over. This doesn’t seem so out of place, remember the time and the rough nature of the area. Just after 5.30 a woman called Elizabeth Long spotted a woman talking on the right hand pavement near the door to Number 29. She didn’t see his face but said he looked foreign with a dark complexion. He was of a shabby genteel look and around five foot in height. 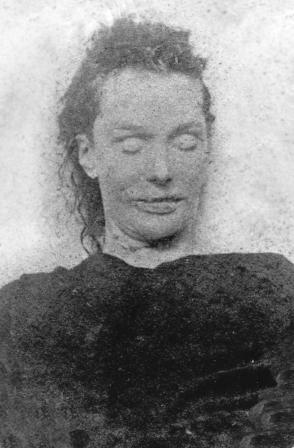 She said that she was sure the woman was Annie Chapman when she identified her at the morgue later on. She said that as it was common place she had not thought anything suspicious of it. Just before 6am it was John Davis, elderly resident of Number 29 Hanbury Street, who came along through to the back door and was left reeling in horror. The man called over two workmen and they were witness to the mutilated corpse of Annie Chapman, the second of the Ripper Victims. She was lying on the ground between the steps and wooden fence. Her head was turned towards the house, her clothes pull up above her waist to expose her red and white stockings. A handkerchief was around her throat, which she had been wearing before, and her hands and face were covered in blood. She had put up a struggle and tried to fight to hold her slit throat. The men set to action to get the police and the horror of the whole thing set in with one of them, James Kent who had to abandon the search and get a brandy. An officer who was approached said he would not abandon his post (what a jobsworth!) but fortunately they got someone via demanding a senior officer at the station. Inspector Joseph Chandler hurried to the place and past the gathering crowd, he had the place cleared and then had Dr Goerge Bagster Phillips, Divisional Police Surgeon, make his way over. 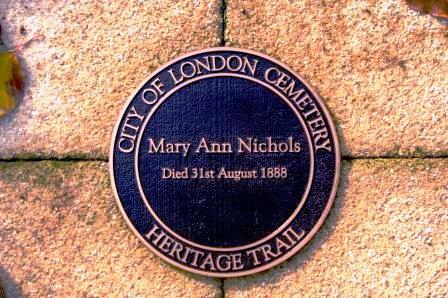 The body was covered until his arrival and by then several hundred people were gathered, she was beyond help and he pronounced her dead sending her to the Whitechapel Workhouse Infirmary. They ordered no one touch the corpse until Phillips could do his post mortem, which revealed a ghastly story. This was partially ignored and then Chandler placed PC Barnes in charge of the watch. Both he and Dr Phillips were utterly furious when they later found only two hours after they left two nurses ignored this, and under the instructions of the Clerk of the Workhouse Guardians they stripped and washed the body. 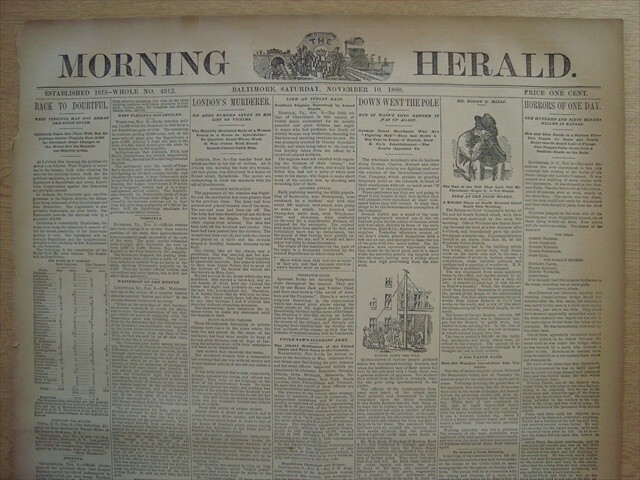 Regardless of this the post mortem revealed a ghastly story. The poor woman’s face was swollen along with her tongue; she had again suffered the terrible throat slash, the blood of which had covered the fence behind. 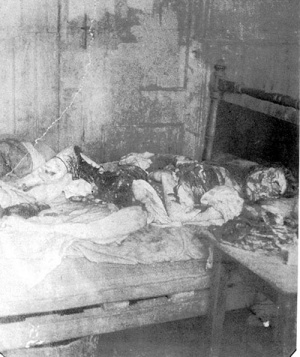 Later on that day in the post mortem it was found that she had been further mutilated when her womb was removed, placing her with a similar scenario to the first victim, Mary Nichols. August 31st 1888 was an unlucky day for a carter named Charles Cross, it was an even worse day for the person he found, Mary Nichols. 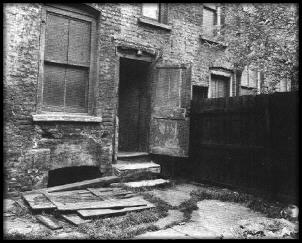 3.40am he was making his way along Buck’s Row in Whitechapel London, he came towards the 1876 Board School (still dominating the street today) and spotted a dark bundle lying in a gateway on the left side of the street. Mr Cross was hoping the bundles might be useful materials for his work, when he got closer he found it to be the prone figure of a woman. He wasn’t sure if she was dead or drunk and asked another carter to come and see her, the other carter was Robert Paul. She was laying on her back with her legs out, and skirts raised over her waist. Cross felt her face which was warm but her hands were cold and limp. They were running late for work and unable to tell if she was near death or dead they pulled her skirt down and then headed off. They aimed to let a policeman know if they saw one. Had the light been better, or they had been there at a later time, they might well have noticed the woman had been subjected to a murder most foul. Nichol’s had had her throat cut so callously and brutally that it nearly severed her head. This discovery was made by the beat officer, Police Constable John Neil, shortly after the carters had left and there was no one else around. He flagged down PC John Thain who was passing at the end of the street by waving his lantern, Thain hurried off to get Dr Llewellyn and PC Mizen arrived having been approached by the carters. They got reinforcements and the police ambulance. At 4am the Doctor arrived and pronounced her dead, noting the severity of the wounds. He found her legs were still warm and told the police she had likely been there no longer than a half an hour. Three slaughterers at the yard opposite saw and heard nothing; the first they heard was when PC Thain passed by to get the doctor. The three men were under suspicion but eliminated by the police later. Patrick Mulshaw, the night watchman working at the nearby sewer works heard nothing either. By now Dr Llewellyn was concerned by the number of spectators and the body was removed to the mortuary. As she was lifted up in the cart Thain spotted that the back of the woman’s clothing was soaked with her blood. This was presumably from the large cut across her throat. 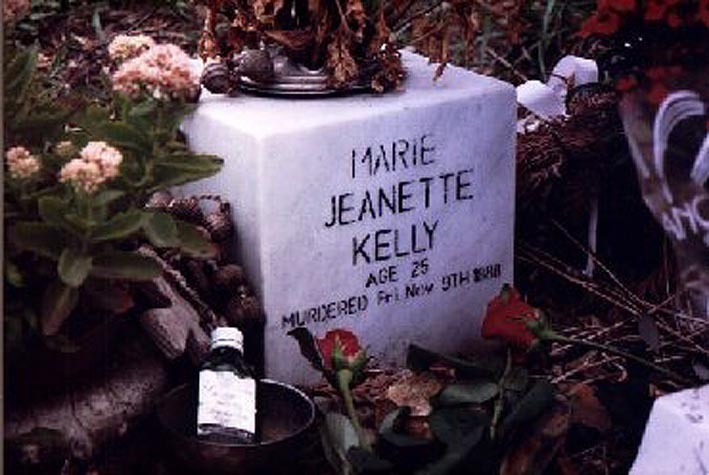 With the details of little blood on the scene it led to the speculation that she had been murdered elsewhere and then dumped. The Times reported this as such but the coroner dismissed this notion. 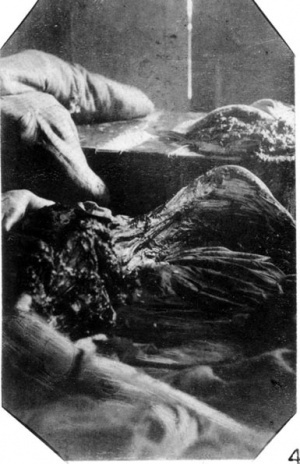 The wound to her throat and abdomen had bled out and been soaked up by her clothing, the wound to her abdomen was not noticed until the inspection at the mortuary. When the inspector came to the scene the residents were washing the blood up. They set to trying to identify her as well only to find themselves being told about Polly, Inspector Spratling then noticed that her petticoats had the Lambeth Workhouse label on them. 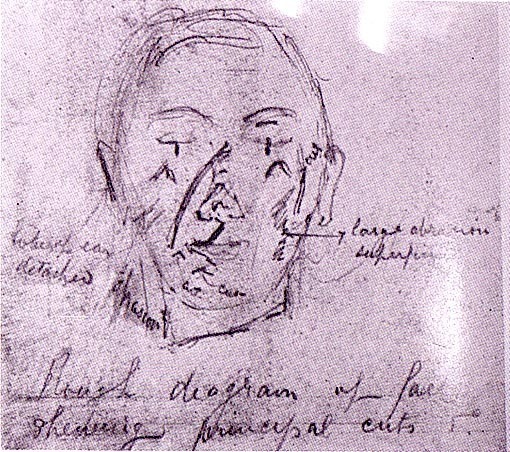 A resident of the workhouse was brought to see the body and was able to identify Mary Nichols, 43 who had been worse for wear and drank her doss money away more than once. Due to her wearing a “jolly bonnet” she felt she would easily make the money needed. She had been killed with ruthless and silent efficiency, she had been left out to be found and with a budy place like Whitechapel the murderer could be lost in the movement pretty quickly. It was also a murder close to a slaughterhouse so blood on the hands of the murderer may well be dismissed by potential witnesses because of the local business.